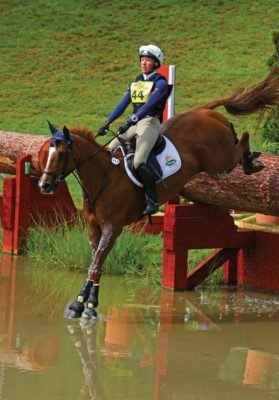 Sport Horses, Dressage Horses and Eventers are extraordinary athletes and can perform physical abilities (running and jumping) that exceed most other animals of a similar size. The superior athletic ability of the horse is attributed to the horse’s high aerobic capacity, large intramuscular stores of energy, an ability to increase the oxygen carrying capacity of the blood, the efficiency of their gate and their ability to thermo- regulate and keep themselves cool when exercising. This article describes how metabolism and energy storage are achieved in the horse. Following Horse feeding the rise in blood sugar initiates insulin release from the pancreas. Insulin allows glucose to leave the bloodstream and enter muscle or adipose (fat) tissue (among other body tissues), thereby returning blood glucose concentrations to baseline. Fibre (e.g., forages such as hay and pasture) are fermented by the good bacteria in the large intestine to produce volatile fatty acids (VFAs), namely acetate, propionate, and butyrate. Once absorbed, propionate is converted to glucose in the liver, while butyrate is converted to acetate. Acetate can then be metabolized to ATP by a variety of tissues or can be incorporated into fat synthesis. 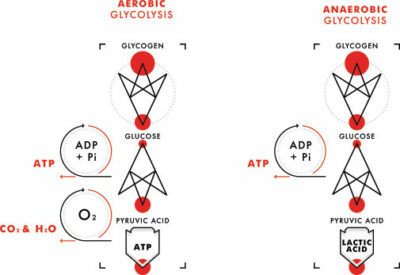 Once inside cells the glucose can either be broken down, which results in the creation of ATP. ATP is the energy or “battery” of the body and enables muscles to contract. When at rest, excess levels of glucose are stored as glycogen (chains containing many thousand glucose molecules) for use during exercise. Ninety percent of the body’s glycogen stores are in muscle and 10% are in the liver. When glycogen stores have run out the body then starts to metabolise fat to create energy and when fat reserves have been used up the body starts to metabolise protein to create energy. Two types of fatigue have been recognised. The first, muscle fatigue occurs when muscles run out of energy sources and can no longer create the ATP that is required for them to contract. The second is central fatigue whereby an increase in serotonin levels in the brain contribute to fatigue. Muscles rely on glycogen as a source of energy, and glycogen reserves can be spared by increasing the fat content of muscle so that the fat metabolism spares the glycogen reserves thus enabling muscles to work for longer before fatiguing. 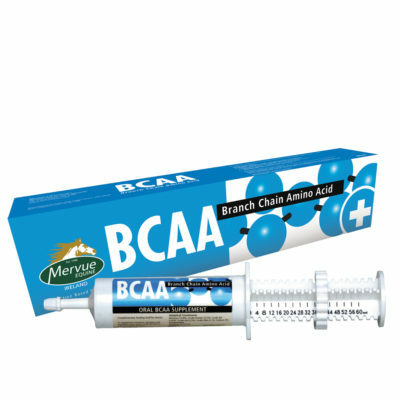 BCAA PASTE contains the three essential BCAAs, leucine, isoleucine and valine to support muscle recovery following exercise. Supplementation with BCAA has been demonstrated to increase the levels of these amino acids in muscle following strenuous exercise. The administration of leucine has been shown to reduce the concentration of amino acids in the blood following exercise, indicating a beneficial reduction in protein breakdown. Additionally, BCAA also contains rosemary a powerful antioxidant to protect muscle cells against oxidative damage and seaweed which acts as a pre-biotic to support intestinal health. Leucine also has a powerful insulin like effect and promotes the uptake of glucose into cells. Several studies have demonstrated that during endurance events horses metabolise a large amount of BCAA to produce energy. BCAA and another amino acid called tryptophan use the same transport system for entering the brain and it has been suggested that as blood and muscle levels of BCAA fall, more tryptophan can enter the brain. Tryptophan is converted to serotonin and increasing levels of brain serotonin may contribute to central fatigue. POWER E contains vitamins E & C and selenium that helps to protect cells against oxidative damage that occurs when fats in cell walls become oxidised (lipid peroxidation) and cells walls then become leaky or rupture. 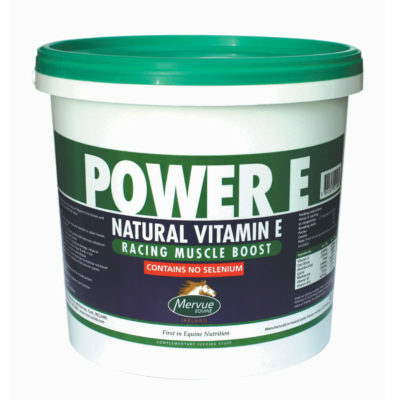 POWER E also contains methionine, which helps to support the liver in metabolism and lysine which is an essential amino acid required for muscle repair. 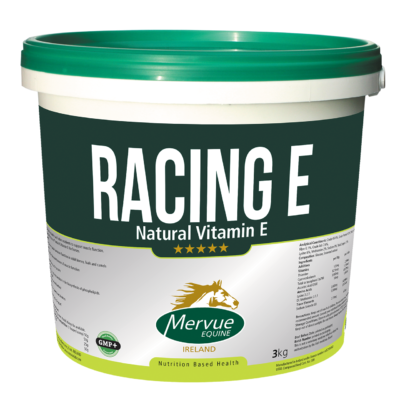 RACING E is a power for long term use in horses in training and POWER E is a paste which as well as containing vitamin E also contains rosemary another powerful antioxidant. POWER E oral paste can be used in the immediate period following strenuous exercise where antioxidant damage is likely to be especially high. 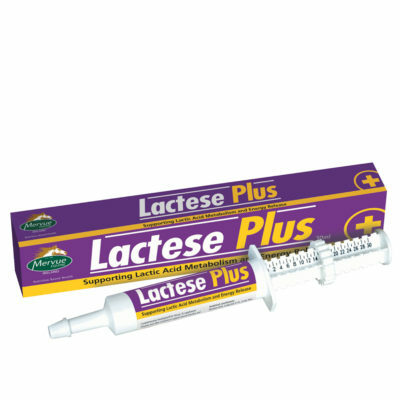 LACTESE PLUS is a paste which contains lipoic acid which is involved in energy metabolism of proteins, carbohydrates and fats. Lipoic acid has physiological functions in blood glucose utilisation and can scavenge several free radicals. Lipoic acid which has been demonstrated to decrease post-exercise lactic acid concentrations in horse and lipoic acid plays a central role in antioxidant production which helps to protect muscles against oxidative damage. Lipoic acid is an important co-enzyme of pyruvate dehydrogenase and facilitates the removal of lactic acid from the muscle and circulation to the liver. In the liver the lactic acid is then turned into glucose via the lactic acid cycle and the glucose is returned to the cells to be used as a source of energy. 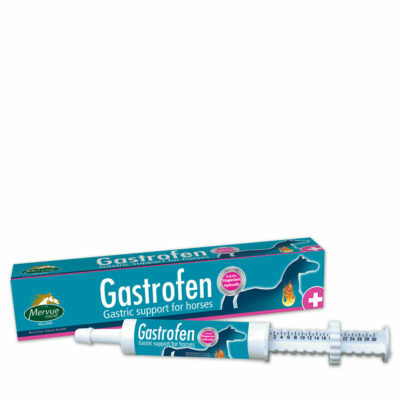 GASTROFEN offers a non-pharmaceutical solution to assist horses with gastric ulcers. GASTROFEN contains a seaweed extract pre-biotic to encourage the growth of good intestinal bacteria, a probiotic containing beneficial intestinal bacteria, threonine to assist with mucous production and the protection of the intestinal wall and vitamin E which acts as an anti-oxidant for damaged intestinal cells. We would also recommend that you feed PRO-BIO FORTE powder as a long term preventative. Intestinal dysbiosis refers to an imbalance between good bacteria and bad bacteria in the intestine of the horse. A healthy population of good bacteria (called microflora) are required for the efficient digestion of food and the manufacture of short chain fatty acids such as propionate, acetate and butyrate that are converted to energy in the liver. A healthy intestinal microflora also synthesis many of the vitamins required for generating energy from carbohydrates, fats and proteins. A balanced and healthy microflora also stimulates the gastrointestinal immune system and prevents the adhesion of bad pathogenic bacteria to the intestinal wall. Sudden changes in diet from feeding grass to feeding of rapidly fermentable, high carbohydrate diets are common practices in the horse industry and have been associated with digestive and metabolic disorders that can impair the performance of horses. Abrupt changes in diet don’t allow sufficient time for the microflora to adapt to the high carbohydrate diet and thus undigested carbohydrates can enter the large intestine in large quantities leading to hind gut acidosis and predisposing horses to the development of acute or subacute laminitis or colitis. Dysbiosis also leads to suboptimal digestion of carbohydrates and thus reduced energy derived from food. Travelling can also cause intestinal dysbiosis in horses, which has been reported after just two hours of transport. Horses that are exercised for prolonged periods of time or in high ambient temperatures and humidity are prone to overheating and one of the first organs damaged by hyperthermia is the intestinal tract. Diarrhoea and loss of integrity of the intestinal mucosae are frequently seen in cases of hyperthermia. 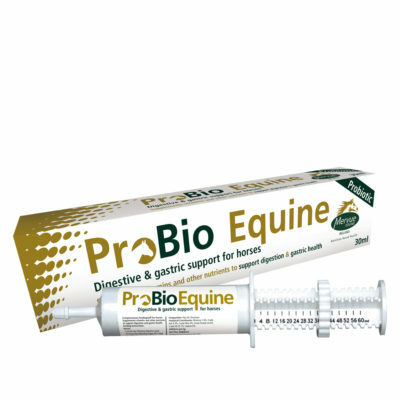 PRO-BIO EQUINE (paste) and PRO-BIO FORTE (powder) contain a live probiotic yeast called Saccharomyces and in horses fed high-starch (grain) diets, live yeast supplementation appears to limit the extent of undesirable changes in the intestinal microbial population. Yeast probiotic has also been shown to benefit the intestinal microbial population after just two hours of travelling. Saccharomyces has also been demonstrated to improve the digestibility of food in horses. 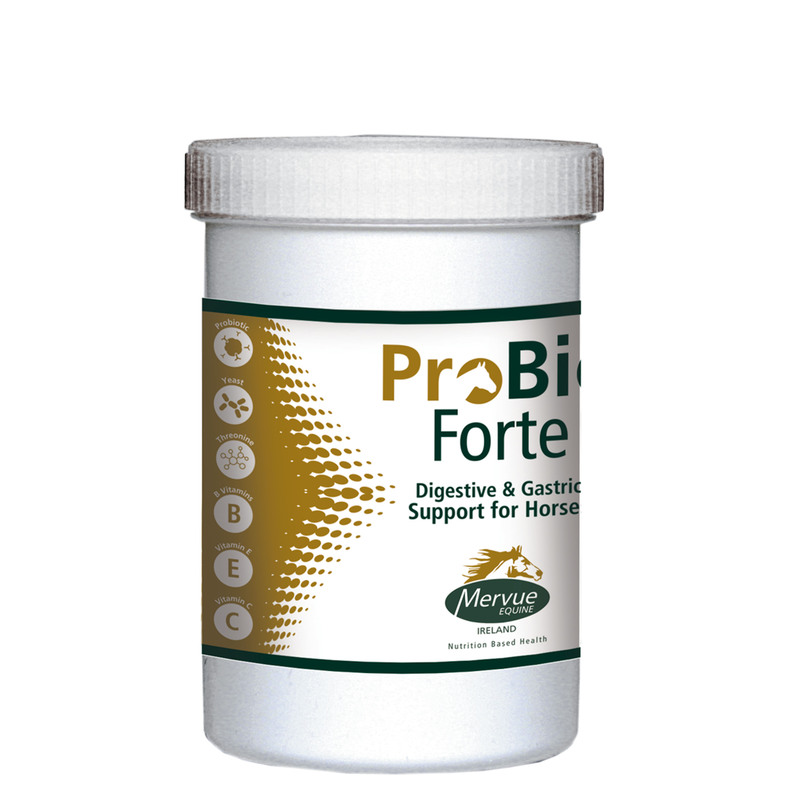 The B vitamins included in PRO-BIO EQUINE and PRO-BIO FORTE support the metabolism of carbohydrates, fats and proteins to produce energy and vitamins E and C are potent antioxidants which help to protect the intestinal wall from damage caused by bad bacteria in cases of intestinal dysbiosis. 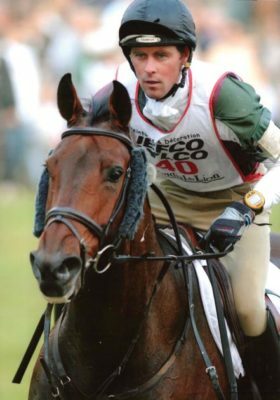 Many horses go off their feed or have interrupted feeding patterns while travelling or performing the B vitamins in PRO-BIO EQUINE and PRO-BIO FORTE help to stimulate appetite so that good tissue levels of carbohydrates, fats and proteins are maintained prior to performing. PRO-BIO EQUINE and PRO-BIO FORTE contains threonine which is the main component of the mucous lining the intestinal tract and protecting the intestinal cells from damage from bad bacteria or toxins. EQUIBOOST is the number one foundation supplement in the World. 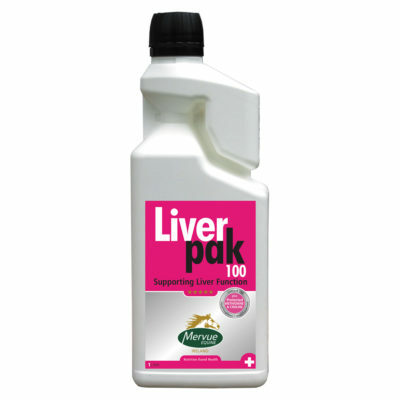 It is a powder containing 26 different vitamins and minerals as well as a prebiotic, omega 3 oil and amino acids. Fructo-oligosaccharides (FOS) are prebiotics which essentially provide a nutrient source for the good bacterial microflora in the intestine and help to maintain a healthy intestinal microflora. EQUIBOOST contains flax oil which is rich in α -linoleic acid, ALA (an omega 3 fatty acid). ALA is found in large amounts in fresh grass and has been shown to positively influence the immune response in horses. Horses with limited access to fresh grass may benefit from flax seed supplementation. ALA is converted to docosahexaenoic acid (DHA) in the body which is then incorporated into muscle and other tissues and has been demonstrated to improve inflammatory status and reduce pain and inflammation in humans. 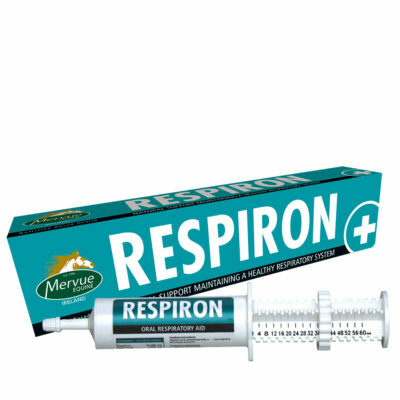 Racehorses are at a greater risk of developing respiratory diseases. In addition to infectious diseases, the management of racehorses is such that normal airway mucous clearance is impaired because horses aren’t grazing with their heads down for prolonged periods. Furthermore, long periods of transport to and from race tracks subject horses to increased levels of ammonia in the environment and a raised head position when tied. Horses are also in close contact in a confined space when travelling which increases the risk of infectious disease. Respiratory tract infection is more likely to occur on longer journeys than short. Upper respiratory tract infection that cause a watery discharge from the nose are less common than lower respiratory tract infections that result in increased mucous and inflammatory cells in the trachea (windpipe). The incidence of inflammatory lower airway disease (IAD) is high in race training yards and especially in young horses. One study reported a mean monthly prevalence of around 12% and an incidence of around 10 cases/100 horses/month. The mean duration of each incident is around 8 weeks, and the disease is often recurrent in individuals. The monthly prevalence and incidence of signs of upper respiratory disease are around 5% and 5 cases/100 horses/month indicating that it is less common. While vaccination is a requirement to enter race track facilities many of the bacteria isolated from cases of IAD are not included in the “flu” vaccination therefore vaccination does not protect the horses against these infections. Bacterial and mycoplasma infections are usually more common in younger horses, but a degree of immunity is established as horses get older. Furthermore, vaccination does not prevent exposure to bacteria and viruses, but it does reduce the incidence and severity of the disease, consequently many horses that have been exposed may not show overt signs of respiratory disease but may be showing signs of poor performance. Exercise induced pulmonary haemorrhage (EIPH) occurs because of stress failure of the pulmonary capillaries resulting from excessive pressures across the wall of the capillary. This could be because of increased positive pressure in the capillary or decreased pressure in the lung alveoli. The incidence and severity of EIPH tends to increase with age. One of the consequences of EIPH is inflammation and increased mucous in the lung because of the presence of blood and severe EIPH can significantly reduce performance. 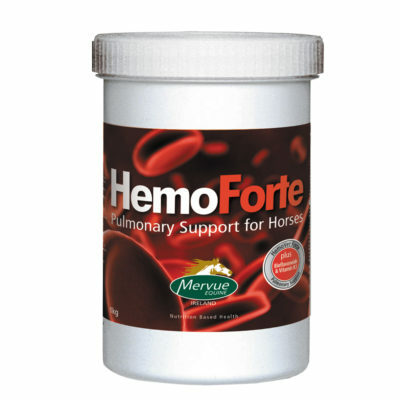 HEMOFORTE contains bioflavonoids (citrus sinensis) which help to increase the strength of the capillary wall. Bioflavonoids also enhance or potentiate the antioxidant effect of vitamin C. Rosemary is included in HEMOFORTE and is also an important antioxidant in limiting the damage or inflammation in the lung caused by the haemorrhage. 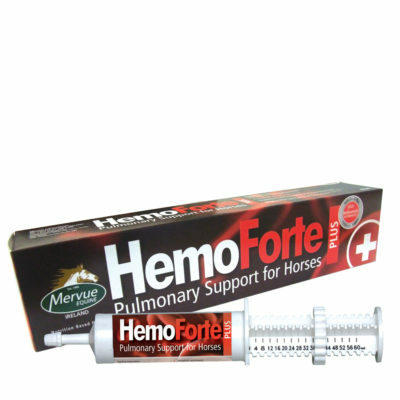 HEMOFORTE contains vitamin K3 (menadione) which plays a role in blood clotting. Although impaired blood clotting is not the reason for EIPH to occur, in situations where there may be reduced levels of vitamin K3 (some moulds counteract the effects of vitamin K3), supplementation may be beneficial. CHALLENGE: Increased electrolyte and amino acid losses in sweat. Horses exhibit the greatest sweating rates of any animal. Sweat production is the primary mechanism of controlling and cooling body temperature in horses. Evaporation of sweat results in cooling of the horse. Roughly 80–70% of expended energy is transformed into heat and the majority (40–60%) of this energy needs to be removed from the body via evaporation, with the remainder eliminated through the respiratory tract. It has been estimated that horses that have been exercised very hard and are demonstrating sweat dripping from above the eyes and under the abdomen had lost 12-18L of fluid representing a not insignificant 2-3% of their body weight. The primary components of horse sweat are electrolytes (sodium, Na; Chlorine, Cl; Potassium, K; and to a lesser extent, calcium, Ca and magnesium, Mg). These three electrolytes are important in many bodily functions not least control of heart rate as well as nerve and muscle function. Calcium is responsible for muscle contraction and magnesium is responsible for muscle relaxation. Insufficient amounts of magnesium can lead to prolonged muscle contraction and tying up. The greater the energy metabolism, the greater the sweat production and large amounts of electrolytes can be lost in a short period of time (e.g. 25% of the total body Cl can be lost in two hours of intense exercise. Sweat production is also greatly influenced by ambient temperature and humidity. High humidity especially, impairs evaporation of sweat. Excessive losses of electrolytes lead to dehydration, fatigue, prolonged recovery and poor performance. Sweat production and evaporation relies on blood vessels close to the skin. However, as increasing amounts of sweat are lost the horse becomes progressively more dehydrated and the blood flow to the superficial blood vessels in the skin decrease to preserve the blood flow to vital organs such as the heart, the brain and muscles and cooling is compromised. Consequently, in horses which intensively exercised for long periods of time, there is a very real risk of hyperthermia (overheating) which results in severe organ damage and can be fatal. In horses undertaking prolonged exercise with large amounts of sweat production there is a significant loss of amino acids in sweat as well as electrolytes. Loss of amino acids which have arisen from protein (muscle) breakdown to create energy, means that these amino acids are no longer available for reuptake into tissues and recovery may be prolonged. 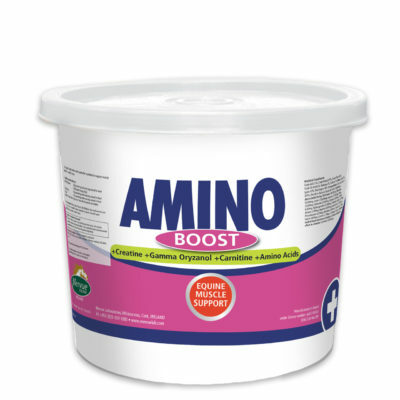 Consequently, dietary supplementation with amino acids may support recovery. 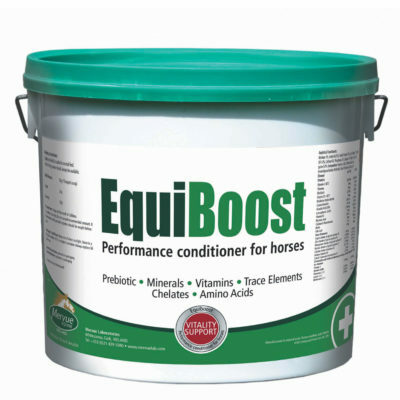 RECOBOOST paste contains the key electrolytes, Na, Cl, K, Ca and Mg. It also contains branch chain amino acids (BCAA) to help to replace those lost in sweat and a range of B vitamins needed to support efficient metabolism and energy production from carbohydrates, fats and amino acids. 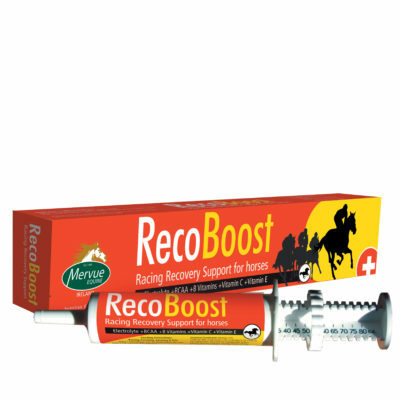 RECOBOOST also contains the antioxidant vitamins C and E.